More capable curators have described the 1912 S81 Helmar silks far more eloquently than I am able to do. They are effusive in their praise, encouraging us to savor the vibrant colors, the sharp detail and the captivating sheen of the material. The combination of these attributes made the S81’s instant classics in 1912, the middle of an era which many consider to be the high water mark for stunning sports art. Their timeless beauty has ensured that, even a century later, they remain highly desirable. There is no doubt that they would be collected more avidly today if they were not so rare, and as a consequence, so expensive. Back in 1912 it would have been an ambitious task to acquire even a single example of this series. Produced by the S. Anargyros Famous Cigarettes company, of which I have written about, the silks were distributed only as a mail-in premium. A collector was required to mail in 25 coupons found within packs of Helmar Turkish Trophy cigarettes in exchange for each silk. The practical purpose of the silks, it can be surmised, was to be sewn onto quilts, blankets and pillow cases as an adornment. 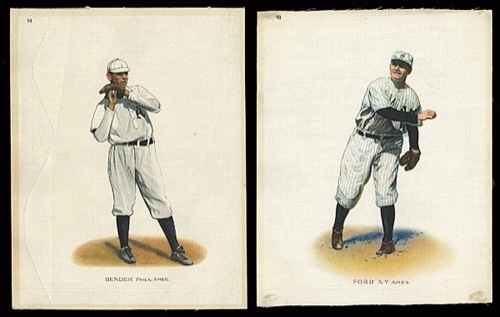 Twenty-five different ballplayers were included in the set. What we’ve discussed thus far are the basics of this legendary series. In my next post I’d like to share some of my thoughts on the design itself and some speculations regarding how many were actually produced. Thanks for reading and thanks to Robert Edwards Auctions for the image below!